The rip back of the sister-in-law shawl went quite well by masochistic standards. In the end, the farm table surface was too slick so I used an old door that I laid on the top of one of the couches and covered it with terry cloth towels. 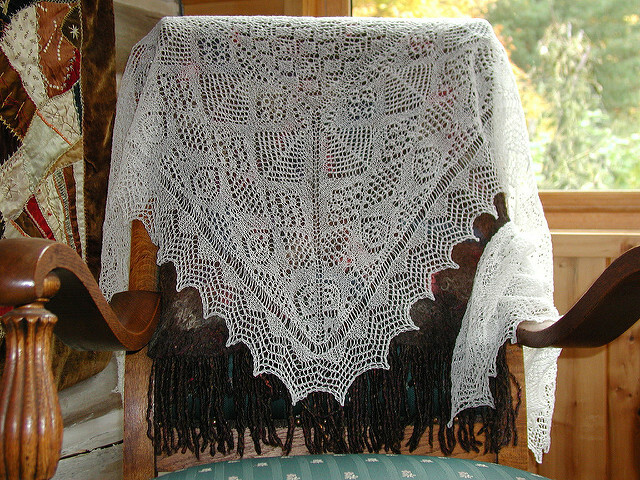 The towels helped hold the shawl in place, whereas it slid around too much on the farm table surface. The Skipper and Yarn Rascal were seated in their chair watching football. It was a terribly humid day so the yarn, which doesn’t normally stick to itself, was sticking to itself. But again, the towels helped hold the shawl in place so I could work out those areas of stickiness. I had figured to rip about 15 to 17 rows of lace work and put a removable stitch marker on the center stitch two rows below where I wanted to stop. About 7 rows into the massive rip back I encountered a real sticking point. I had forgotten that I had joined another ball of yarn at that junction and in the manner of anyone with a good obsessive compulsive disorder over yarn ends hanging off projects I had woven in those suckers. Because I was terrorized in my youthful knitting days by an expert knitter–another story entirely–I have learned to weave in ends so that 1) you can’t see them and 2) they are locked in and won’t come out, thanks to a little trick I learned from that expert knitter. A strong spotlight and magnifying glass were employed as I tried to find those woven in ends and the point at which they were locked so I could carefully snip them loose and continue with the rip back. It was delicate surgery, the kind that rates right up there with brain surgery. Pull, snip or otherwise disturb the wrong bit of yarn and you’ve botched it. I had followed one woven end to the lock point and was trying to decide which particular yarn needed snipping when the cricket showed up. One second I am bending over a shawl, the next I am face to face with a cricket that looks much larger than it is thanks to the magnifying glass. The folklore about crickets is that if they are in your house and alive that means good luck. If you kill it or it is dead that means bad luck. The cricket under the magnifying glass was clearly alive and did what crickets do: it chirped. This caused me to snip and the two sounds together drew a rather excited Yarn Rascal to the area. He trampled over the shawl chasing the cricket which had jumped onto the floor. My main concern now was not the shawl, but that Yarn Rascal not eat the cricket. As Yarn Rascal and the cricket and I chased each other, The Skipper lamented over not being able to watch one football game in peace. To snap The Skipper out of his lament I quickly pointed out that if Yarn Rascal ate the cricket it would mean a trip to the emergency vet and he would miss not only this game but the next one coming on too. This mobilized The Skipper into action and we finally caught Yarn Rascal. The cricket had escaped into a corner and disappeared. With peace now restored, the football game blaring in the backround and The Skipper and Yarn Rascal seated once more in their chair, I returned to the delicate operation of ripping back the shawl. I picked up the shawl from the floor and carefully laid it back out. It was immediately clear that the rip back point had to be moved a few rows further down due to snags and a large hole that now replaced the area I had so carefully snipped. In addition, I had now lost count of the number of rows that had been ripped back and therefore lost my place on the seven charts that make up the pattern. In short, it was no longer a methodical, brain surgery kind of operation. It had become a rip the %&$! @*% thing back, pick up the stitches, find where I was in the charts and get on with it. This attitude change made all the difference. I am now once again knitting on the shawl. The Skipper has watched two entire football games without being interrupted. The cricket still lives, chirping in the corner of the living room. Yarn Rascal is madly digging in the rug near the chirping sound. Peace has been restored. Well it’s happened. In my last post I was bragging about how well the sister-in-law shawl was going and I ended by saying something foolish like the knitting would roll on smoothly like a steamboat on a river. I guess that last line really pushed the knitting powers-that-be over their edge. Instead of easily knitting away today I am ripping back a full 17 rows of 500 plus stitches. If that’s not ouch worthy enough, the 17 rows are beyond the life line. Yep, I am flying without a net on this one. When I realized my mistake last night I did the only thing a respectable knitter could do: I took myself off to bed and wept for 15 minutes. Then I got up and paced the room for 20 more minutes. Once the hysteria settled down, I sat on the edge of the bed and felt drained. The end of the shawl had been in sight, I just needed to navigate two more pages of charts. Ye gods! I say it is unfair. But knitting, like life, is seldom fair. At the deepest part of night, with Yarn Rascal running up and down the hall with yet another skein of yarn stolen from the yarn vault, I came up with a plan. I needed to find a large flat surface that is high enough to prevent Yarn Rascal from getting on it to help me, but at a comfortable height for me to work. We have a farmhouse table that we use for eating on. If I remove all the chairs so the little darling can’t jump from floor to chair to table this might work. The plan is to lay the shawl out flat on the table and slowly rip out the offending rows. The life line will be threaded on the yarn needle ready to catch all the little stitches at the correct row. The correct row will be marked with a removable stitch marker. This is my dream, at least. Before I attempt this operation I am going to meditate and do some deep breathing exercises. I want to be in the proper frame of mind and relaxed. In the meantime, Yarn Rascal has been stalking the area where the shawl resides in its crumbled mess. He senses something big is going to happen. Wish me luck. I say this, not to antagonize the knitting-gods-that-be, but my current lace shawl project is not as masochistic as it could be and I am instead constantly thinking about undertaking a real Shetland Shawl project. Hence the next debacle project on my needles will be the Cameron Shawl by Susan Miller created on US 3 needles in lace weight Shetland yarn. It’s the kind of yarn that doesn’t rip back at all. Let me clarify what I mean by “not as masochistic as it could be”. I still have three full lace charts to work in which anything that can go wrong probably will go wrong. I have, for instance, ripped out the current row of 500 plus stitches three times, only to make yet another mistake so it’s up to four rip backs. I have been so tense relaxed while knitting this particular chart that I have gotten lymphedema in my left arm (the mastectomy side) which has made me lose three days of knitting in order to lessen the swelling. Those days were given over to specific arm exercises, lymphedema massage to help drain the fluid, and wearing a lymphedema sleeve that fits so tight that it activates my claustrophobia and sends me into a panic state. Still, I am determined to take on the Cameron Shawl. Why? Because I want to move out of my comfort zone in knitting. 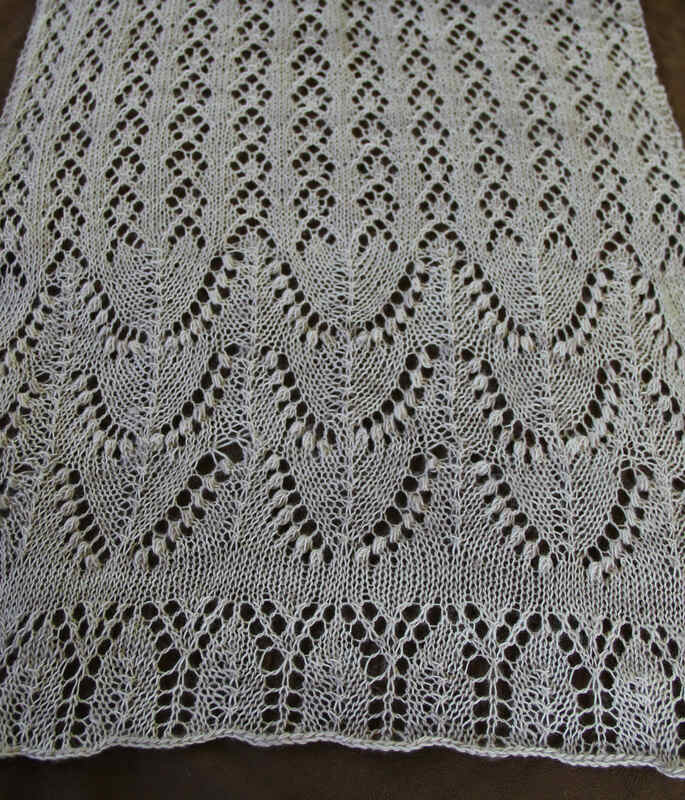 I want to test and expand my lace knitting skills and I have always thought a Shetland Lace Shawl is a true test of one’s knitting prowess. The only way for me to grow as a knitter is to keep moving beyond what I am comfortable with and know about. Yes there will be mistakes, perhaps even tears and a lot of frustration, but I think it will all be worth it (in a kind of nervous breakdown way) to learn something new and challenge my skills to step it up a notch. I don’t knit to be bored. I like to be excited with what is being produced by my yarn and needles. I think this Cameron Shawl will shake things up a bit. For now, the work is on the current shawl which needs a few rows ripped back because I really don’t know what happened on the left hand side of the spine but it doesn’t look like the right hand side. After I get that figured out, I’ll be rolling like a steamboat on a river. Knitted lace looks so much better after it is blocked. The MIL stole is done and was sent to her just in time for her birthday. She loves the Estonian Garden Shawl. 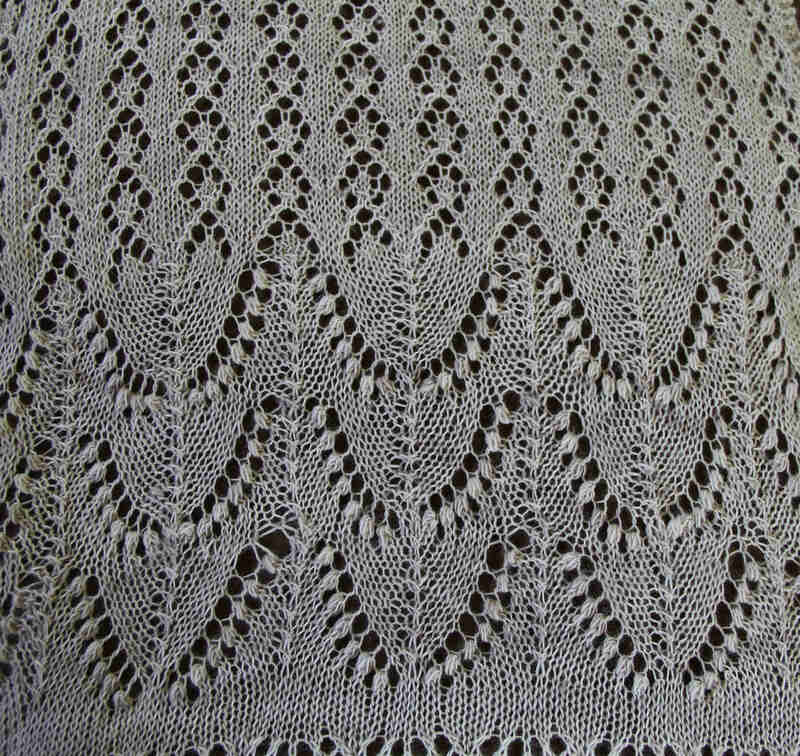 This was knit with MadelineTosh Lace in the Antique Lace colorway. As always with MadelineTosh yarns I loved working with it. While it looked like a hot mess before blocking and I wasn’t sure I’d chosen the right color, all that uncertainty faded away when blocked. The nupps were not difficult at all. The key to nupp making is when wrapping the yarn around the needle wrap it gently by just laying it over the needle. Then on the reverse side when it comes to purl 5 together it is easy to slip the needle into the stitches and accomplish the nupp. This way the nupp is neither too tight nor too loose. 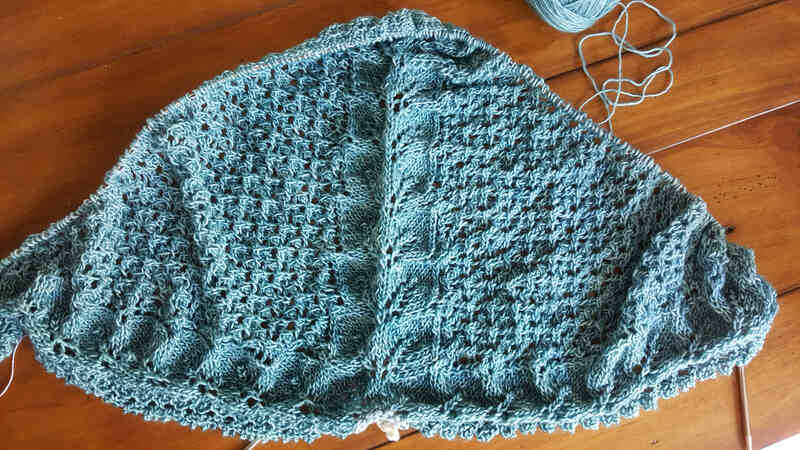 I am currently working on my sister-in-law’s shawl. I am using MadelineTosh Light, a heavier yarn weight than the lace in the Happiness colorway which is exclusive to Happy Knits yarn shop in Portland Oregon. This is the third project I’ve used this colorway on and I just love it. If happiness were a color this would be it. Although the project looks like a hot mess it is just in need of a blocking. 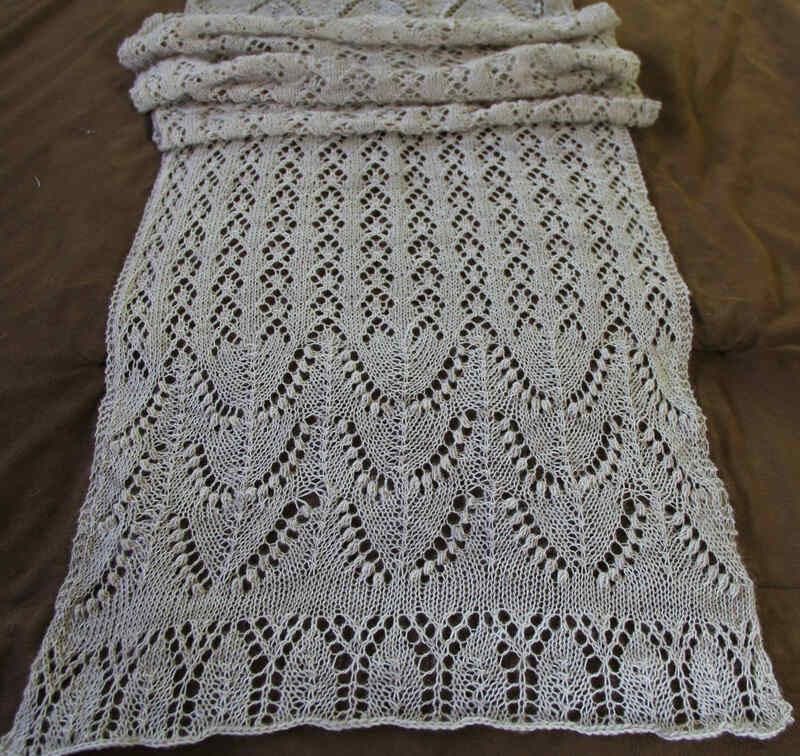 The shawl is Pothos by Anne Hanson. I know I have been quiet lately, but a lot has been going on in the background with the health of my parents. Anyway…today’s masochistic knitting question: When is a lifeline not a lifeline? Answer: When it’s holding the incorrect number of stitches due to missed yarnovers and decreases. How to prevent this? Always count your stitches before you move your lifeline.